The Panama poison dart frog, also called the common rocket frog, lives in Columbia and Panama. 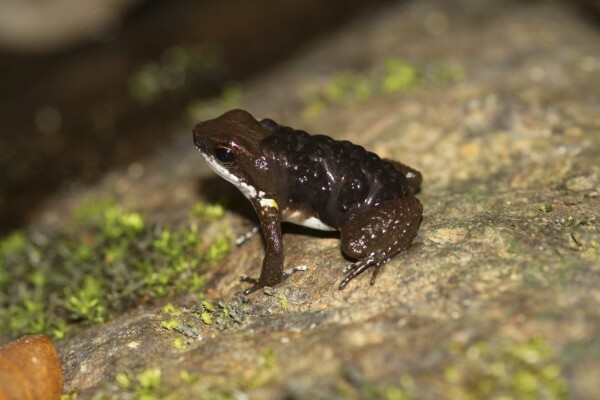 They prefer to live in humid forested environments along rocky streams in lowland areas and are members of a poisonous family of amphibians. Like the green poison dart frog, these guys monitor their eggs after they lay them on piles of leaves, and females carry the newly hatched tadpoles on their backs for up to nine days where they continue to grow, before eventually being released into a fast-flowing stream to complete their development. This tends to be a behavioral trend among poison dart frogs, though depending on the species, either the male or female will care for the young and move them. In addition, different species of poison dart frogs will carry their young to different kinds of water sources, whether it is a pool, lake, stream, etc. These frogs are diurnal, meaning that they are most active during the day. Although not endangered, their numbers are decreasing, most likely due to deforestation, illegal planting, pesticides, logging and human settlement. When its habitat is altered, these frogs do not adapt well, so in order to preserve the Panama poison dart frog population, there have been some protected areas established throughout Central America.